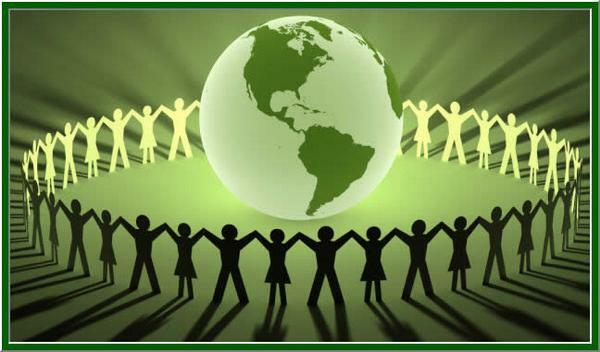 In an effort to be more environmentally friendly, Katherine Roberts has kindly volunteered to coach Chabad of Cole Valley in caring for the environment and using more sustainable choices in many areas of Chabad programming. This is a work in progress so please be patient with us as we develop this project further. Since September 2013 we have already incorporated a number of important steps to a more sustainable future. 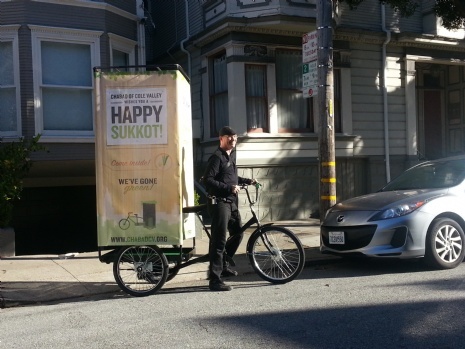 For the holiday of Sukot, Chabad of Cole Valley would setup a Mobile Sukah on a pickup truck. This year, thanks to the vision and generosity of Katherine Roberts, we were able to change our mode of transport from fossil fuel powered to human powered and now, we have a mobile sukah on a beautiful hand crafted Workmans Tricycle made in New York. The Workmans bike is in use on a regular basis providing human powered transport instead of burning carbon emitting fuel. The Ticycle was also used for the Bike Menorah Parade. At the 2nd Annual Community Celebration and Silent Auction, we are proud to say that the delicious sushi was made with the world in mind. Thanks to the efforts of Katherine Roberts, we were able to source sustainable fish and locally grown organic rice, for all the sushi that night. We hope to continue this practice for future events. All this has been made possible through the generosity and inspiration of Katherine Roberts, who is working very hard to help Chabad continue on the sustainable and environmentally friendly path. If you have any questions or ideas, please feel free to email us at info@chabadcv.org.